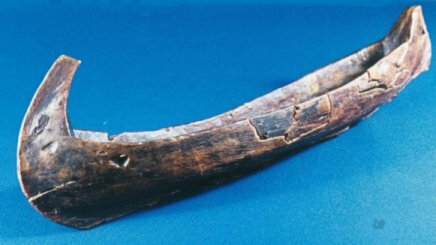 This image shows a wooden replica of an ocean-going Viking longboat that was discovered during the National Museum of Ireland’s excavations at Winetavern Street, Dublin. Most likely a toy, the vessel measures approximately 37 cm in length by a maximum of 8.5 cm in width. Originally the boat would have had a mast and a sail, as evidenced by the presence of a mast-step and shroud holes for securing the rigging. Another hole at the end of the vessel was probably used to attach a stern rudder (Christensen 1988, p. 20). 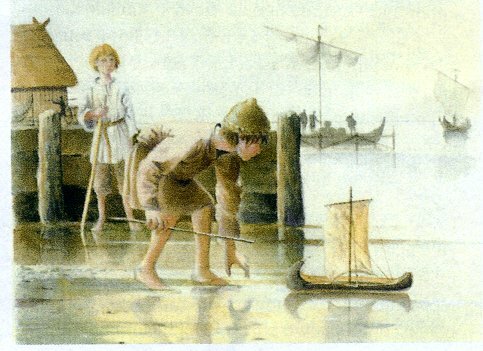 Dating from the 12th century, the boat was more than likely the prized possession of a child who raced it on the River Liffey or nearby streams (see image below). Another similar, but less complete, toy boat was also recovered from Winetavern Street, while comparable vessels are known from Viking Age sites in Norway (ibid, p. 24). What a fabulous toy to possess a thous and years ago! !